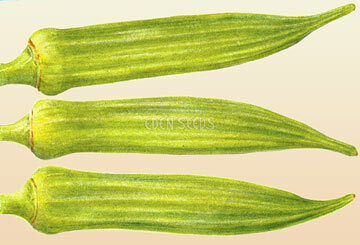 Uniform dark green spineless long pods, fine quality, prolific, harvest at 7-8cm, matures about 80 days. Read more on growing Okra here. Annual bush to 1.2m, taken from Ethiopia in pre-historic times. Also know as Gumbo. Use similar growing conditions as tomatoes. Thrives in well drained soils in full sunlight. Harvest all pods when young at 7-10cm. Use fresh or dried in soups and stews. Sow after last frost.